CEQ is a Brisbane Based Disability Service for Babies Children & Young Adults. CEQ is dedicated to providing quality Conductive Education (CE) programs for individuals with neurological disabilities & developmental delay. CEQ operates five days per week, 48 weeks per year. Programs are staffed 1:1 by our transdisciplinary team of Physiotherapists, Teachers, Conductors, Occupational Therapists, Speech Pathologists and therapy/teaching assistants. CEQ offers Early Childhood Intervention for Babies, Pre-Prep Programs, School Age Programs as well as day programs for young adults. At least once a year, there is an opportunity for participants to attend CEQ ‘Camp’ where skills gained through CE programs are put into action in an environment away from CEQ or home. CE is a dynamic, lifelong, educational program that teaches people how to become active participants in life. The purpose of CE is the development of the whole person physically, cognitively, emotionally and socially. Physical and cognitive tasks are integrated to develop skills including sitting, standing, stepping or moving with the appropriate amount of support in a learning environment. CEQ’s three Directors, Annette (Teacher and Principal), Jody (Parent) & Angela (Parent), had been involved in intensive Conductive Education programs for many years. When those programs were no longer available, they searched for similar but nothing existed in Queensland. They decided their only option was to create a centre where quality CE programs were available for babies, children and young adults who would benefit from CE the way they had seen so many over the years including Jody’s & Angela’s sons. 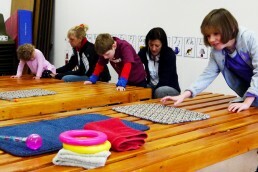 Conductive Education Queensland (CEQ) commenced programs in January 2011, in a single room in a church complex in Coopers Plains. Over the years the programs grew from a few small groups attending once or twice a week to multiple programs for Babies, Toddlers, Children and Teens. 2014 saw the introduction of CEQ’s Adult Conductive Education (ACE) for those who had completed their school years. There was one participant who attended three times per week participating in a variety of activities. The ACE program is now highly sought after and has 24 participants who attend between two and five days per week. With the introduction of the NDIS, CEQ experienced a dramatic growth in numbers which meant a larger and more appropriate facility was needed urgently. CEQ moved to its new premises at 30 Bellrick Street, Acacia Ridge in June 2018. Our new place has undergone a purpose fit-out boasting four classrooms, technology hub, office, kitchen, staff and parents’ room as well as fully-equipped changing spaces. 2019 has seen the addition of many new staff members including an Occupational Therapist and Speech Therapist to complete the Professional Team as well as our Administration Officer, the friendly face who will greet you at the door.